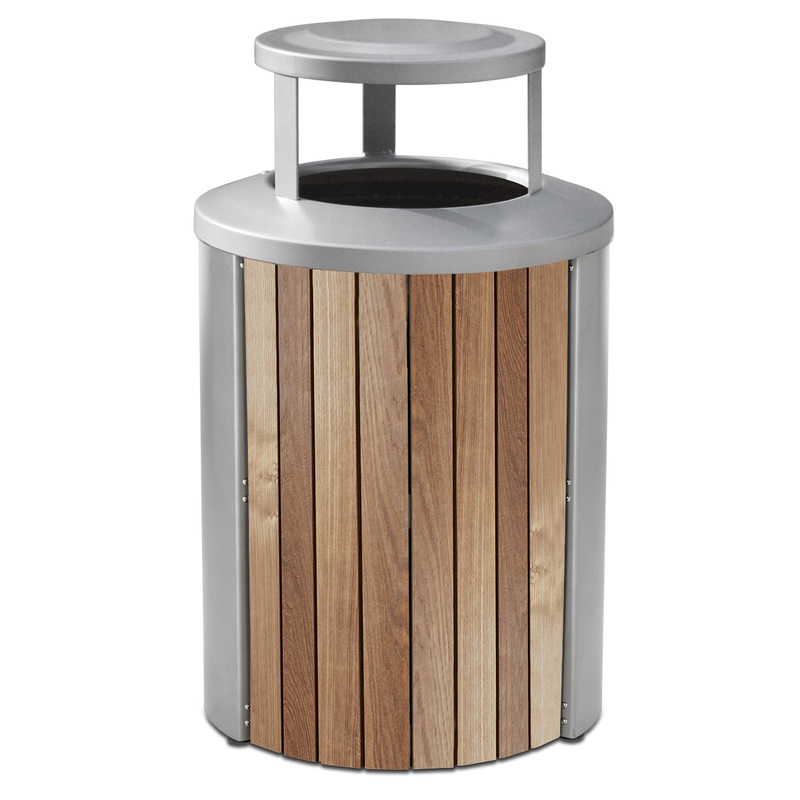 This Madison Collection 35 Gallon Recycled Plastic Open Top Trash Receptacle brings eco-friendly trash receptacles to an exciting new level. 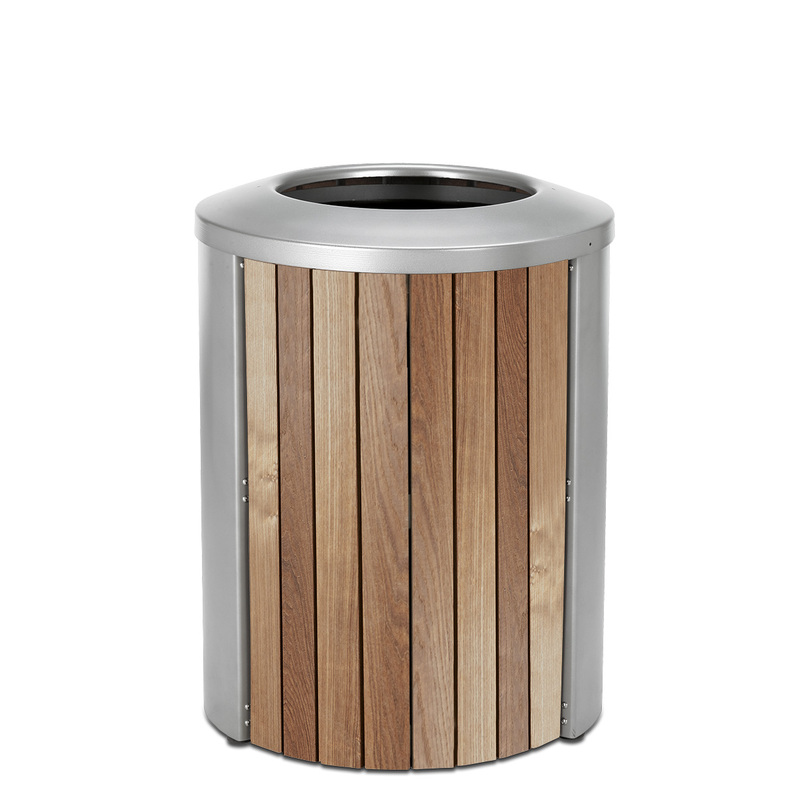 Elegant receptacle sides are made from 95% recycled plastic by weight. 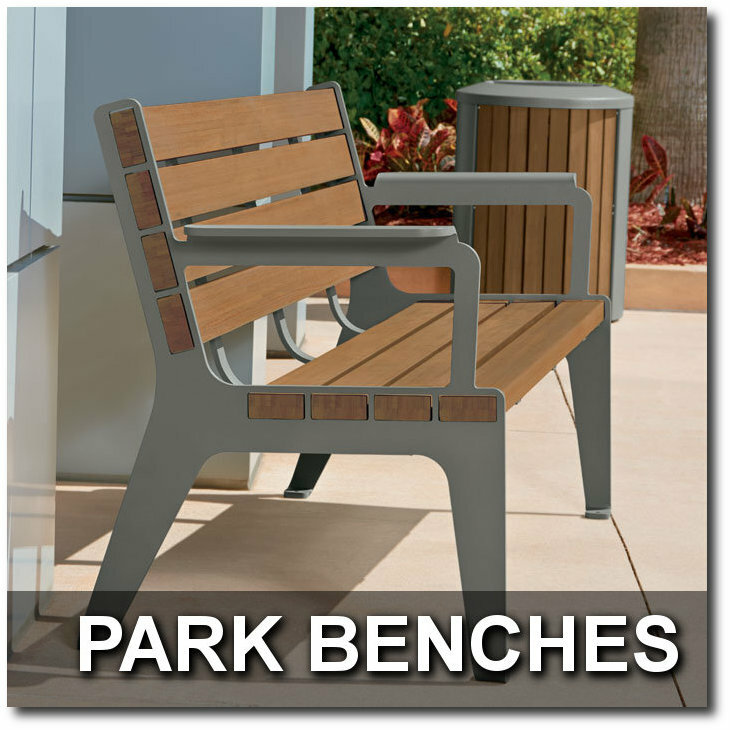 These exceptionally strong planks integrate with a contemporary, powder-coated steel frame creating an elegant addition to any upscale outdoor setting. 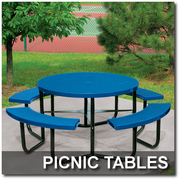 Pre-drilled holes in the base allow for easy surface mounting for permanent placement. 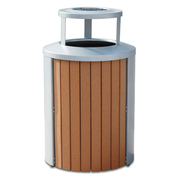 This fade resistant, powder-coated receptacle also features a state-of-the art primer that prevents rust. Open Top Lid is attached to the frame with strap to prevent theft. Includes reusable plastic liner. 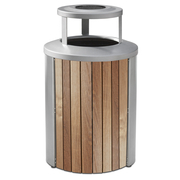 This Madison Collection 35 Gallon Recycled Plastic Trash Receptacle with Ash/Trash Top brings eco-friendly trash receptacles to an exciting new level. 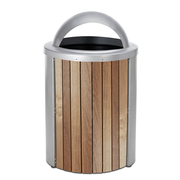 Elegant receptacle sides are made from 95% recycled plastic by weight. 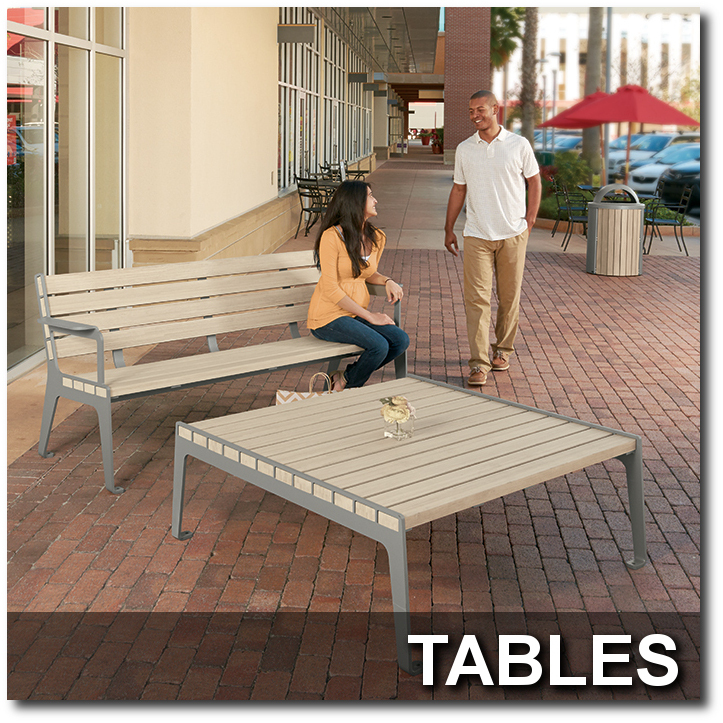 These exceptionally strong planks integrate with a contemporary, powder-coated steel frame creating an elegant addition to any upscale outdoor setting. 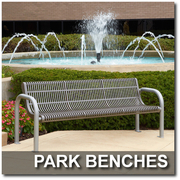 Pre-drilled holes in the base allow for easy surface mounting for permanent placement. 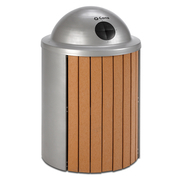 This fade resistant, powder-coated receptacle also features a state-of-the art primer that prevents rust. Sand urn for safe cigarette disposal. Ash/Trash Top is attached to the frame with strap to prevent theft. Includes reusable plastic liner. 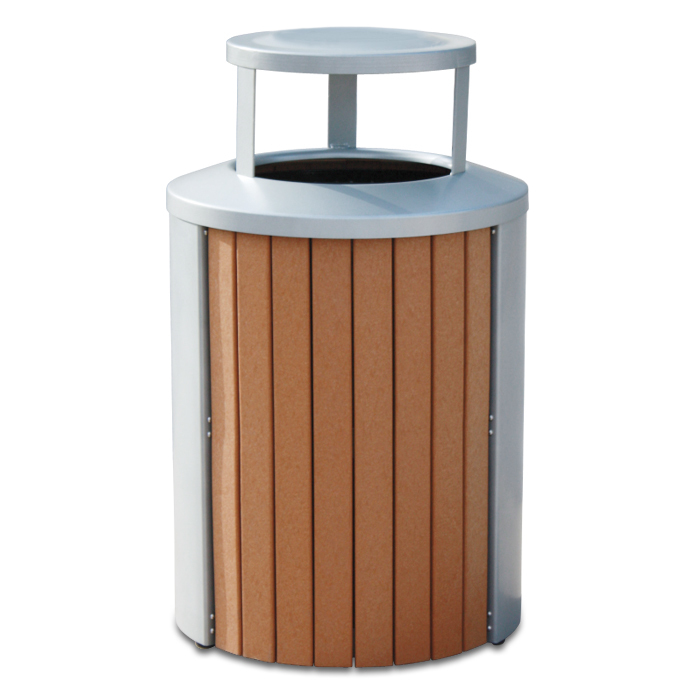 This Madison Collection 35 Gallon Recycled Plastic Trash Receptacle with Bonnet Top brings eco-friendly trash receptacles to an exciting new level. 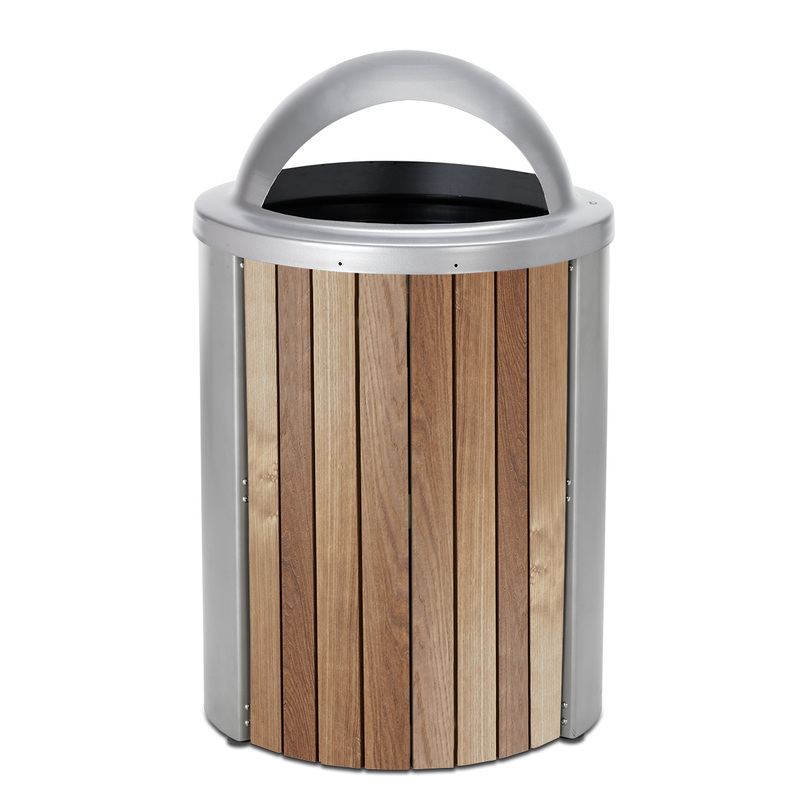 Elegant receptacle sides are made from 95% recycled plastic by weight. 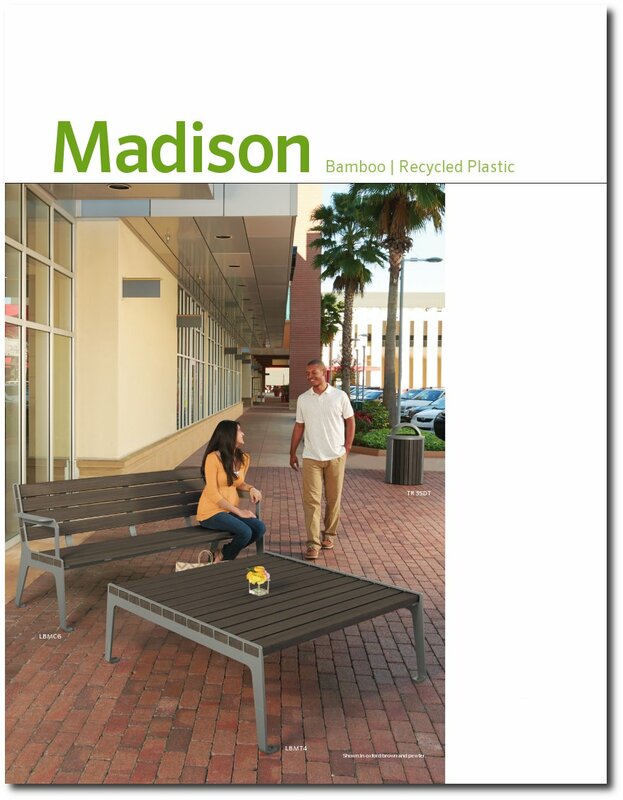 These exceptionally strong planks integrate with a contemporary, powder-coated steel frame creating an elegant addition to any upscale outdoor setting. 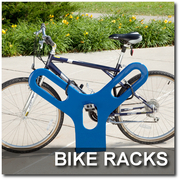 Pre-drilled holes in the base allow for easy surface mounting for permanent placement. 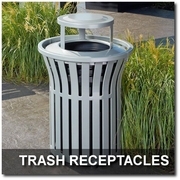 This fade resistant, powder-coated receptacle also features a state-of-the art primer that prevents rust. Bonnet Top is attached to the frame with strap to prevent theft. Includes reusable plastic liner. This Madison Collection 35 Gallon Recycled Plastic Trash Receptacle with Ash Bonnet Top brings eco-friendly trash receptacles to an exciting new level. 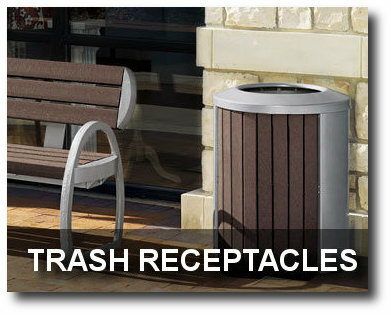 Elegant receptacle sides are made from 95% recycled plastic by weight. These exceptionally strong planks integrate with a contemporary, powder-coated steel frame creating an elegant addition to any upscale outdoor setting. 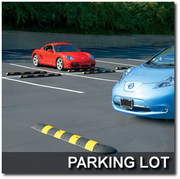 Pre-drilled holes in the base allow for easy surface mounting for permanent placement. This fade resistant, powder-coated receptacle also features a state-of-the art primer that prevents rust. 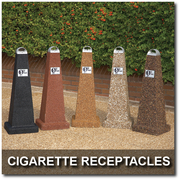 Sand urn top for safe cigarette disposal. Ash Bonnet Top is attached to the frame with strap to prevent theft. Includes reuseable plastic liner. This Madison Collection 35 Gallon Thermory Slat Trash Receptacle with Open Top brings eco-friendly furnishings to an exciting new level. 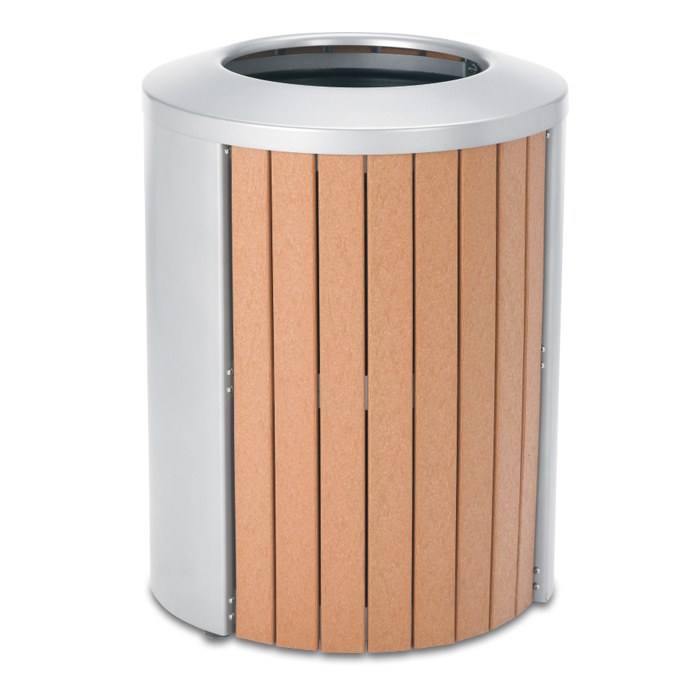 The elegant side slats are made from low maintenance Thermory planks made from thermally modified North American Ash - a sustainably-harvested & renewable temperate hardwood. Planks new are a beautiful chocolate brown that will naturally age to a silver/grey color if left untreated; color can be maintained by using standard deck oil as needed. The lightweight steel frame is protected by a state-of-the-art primer that prevents rust & a high-quality textured powder coat finish. Top removes for access to inner reusable plastic liner. 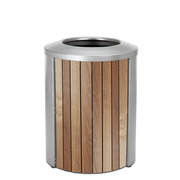 This Madison Collection 35 Gallon Thermory Slat Trash Receptacle with Open Dome Top brings eco-friendly furnishings to an exciting new level. The elegant side slats are made from low maintenance Thermory planks made from thermally modified North American Ash - a sustainably-harvested & renewable temperate hardwood. Planks new are a beautiful chocolate brown that will naturally age to a silver/grey color if left untreated; color can be maintained by using standard deck oil as needed. The lightweight steel frame is protected by a state-of-the-art primer that prevents rust & a high-quality textured powder coat finish. Top removes for access to inner reusable plastic liner. This Madison Collection 35 Gallon Thermory Slat Trash Receptacle with Bonnet Top brings eco-friendly furnishings to an exciting new level. 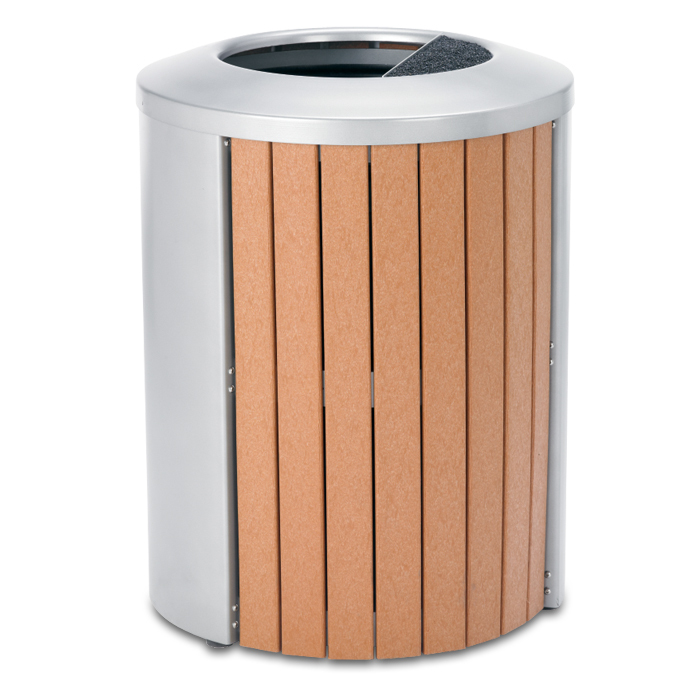 The elegant side slats are made from low maintenance Thermory planks made from thermally modified North American Ash - a sustainably-harvested & renewable temperate hardwood. 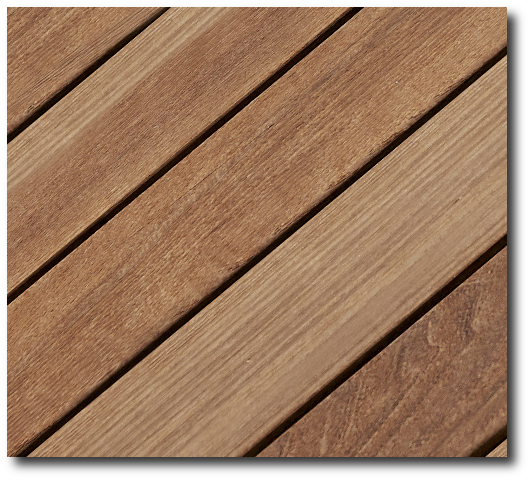 Planks new are a beautiful chocolate brown that will naturally age to a silver/grey color if left untreated; color can be maintained by using standard deck oil as needed. The lightweight steel frame is protected by a state-of-the-art primer that prevents rust & a high-quality textured powder coat finish. Top removes for access to inner reusable plastic liner. This Madison Collection 35 Gallon Thermory Slat Trash Receptacle with Bonnet Ash Top brings eco-friendly furnishings to an exciting new level. The elegant side slats are made from low maintenance Thermory planks made from thermally modified North American Ash - a sustainably-harvested & renewable temperate hardwood. 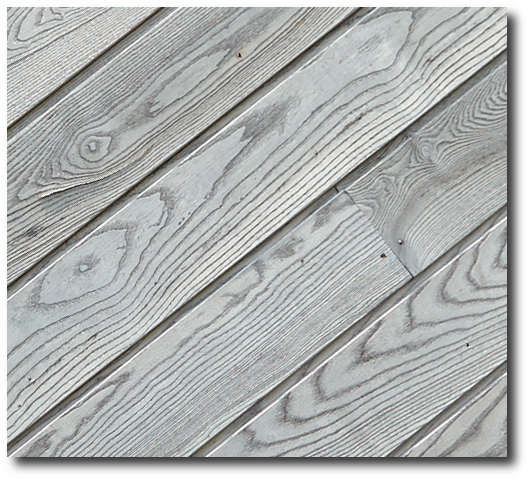 Planks new are a beautiful chocolate brown that will naturally age to a silver/grey color if left untreated; color can be maintained by using standard deck oil as needed. The lightweight steel frame is protected by a state-of-the-art primer that prevents rust & a high-quality textured powder coat finish. Top removes for access to inner reusable plastic liner. Sand urn top allows for safe cigarette disposal.